Where Did The Term 'Bunga Bunga' Come From? : The Two-Way There are a handful of explanations of where the term might have come from. But one of the more concrete ones is that it came from Libya's Moammar Gadhafi. 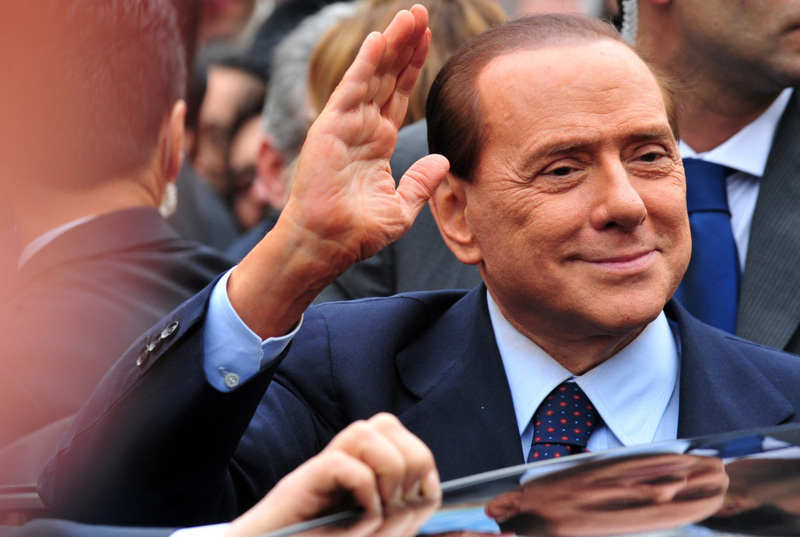 Italian Prime Minister Silvio Berlusconi acknowledges his supporters after a legal hearing on March 28. As Korva reported earlier, Italian Prime Minister Silvio Berlusconi's trial opened today. It also immediately adjourned because neither Berlusconi nor the woman involved in the case showed up. The case is about underage prostitution and a lot of the talk, as we've reported before, has centered around what Berlusconi called "Bunga Bunga" parties. But where does the word "Bunga Bunga" come from? Today, Anna Louie Sussman has a piece in The Atlantic that reveals just that. Sussman posits that Berlusconi could have gotten term from a century-old story in which an Irish Aristocrat dressed in blackface, pretending to be the Abyssinian royal family in order to inspect British Warships. In 1910, a Mirror reporter wrote that the aristocrat had used the word "bunga bunga" to imitate Africans. [Cecilia] Robustelli[,a linguistics professor at the University of Modena,] is aware of the Abyssinian backstory, but, she said, "I doubt Berlusconi knows anything about that — that's a bit too intellectual, I'm afraid." More likely, she suggested, Berlusconi, as with many Italians, is familiar with "Civilization," a song from the late 1940s whose chorus runs "Bongo, bongo, bongo, I don't wanna leave the Congo." Berlusconi is also known for telling an old, vulgar joke about two colonial officers who are captured by a sodomitic African tribal chief who forces them to submit to "bunga bunga." In his updated version — political humor at its finest — the colonial officers are replaced by two opposition ministers. El-Mahroug, the exotic dancer who unleashed BungaGate, told prosecutors that "Silvio told me that he'd copied that expression — 'bunga bunga' — from Qaddafi: it's a rite of his African harem."